This is probably the best thing we have done to our property since moving here several years ago. Installed an automatic gate opener! An exit sensor wand buried in the driveway lets cars out automatically, so visitors can leave without any action by you. We have a color monitor inside the house through which we can view the entire gate entry area, see and talk back-and-forth to visitors. Best of all, you can open and close the gate from the inside monitor console, without even getting out of your chair! [You can see it in action in the video below]. Was all this security really necessary? We own 3 acres of land inside the boundaries of a major national forest. People love this forest, and it draws visitors year-round. Problem is, they don't realize there is some private property inside the forest. So we had curious hikers, four-wheelers, dirt bikes and even jeeps and pickup trucks enter the property, just to take a look around. Day and night! We figured they thought since they were in the forest, it was all national property, and so anything, including our property, was fair game. But we got tired of chasing these uninvited guests off. Not to mention which, this was just an unsafe and unsecure situation. 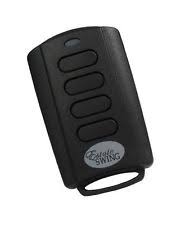 Enter our Estate Swing Gate Opener. This thing is really cool, and totally secures our homestead. 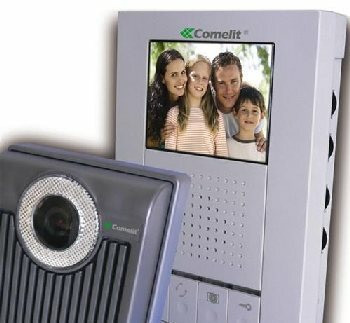 The entire package ran us about $1,000, but that included all the bells and whistles of a full-service, remotely monitored and operated gate. Tip #1: If you decide to install one of these babies, get the battery-powered gate with solar trickle, not the electric powered. Our gate opens and closes fine during power outages, which happen frequently here. Gate runs on a marine battery, so it keeps on truckin', no matter what. Tip #2: Hardwire the monitor to the house; do not go wireless. No matter what range they say the wireless model has (300 meters). 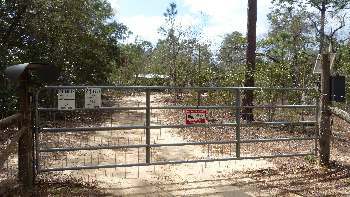 Our gate is only a hundred feet from the house; and the wireless model did not reach. So we had to send it back and get the hard-wired model. 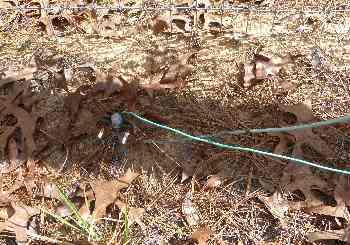 Then we bought underground-grade electric wire and started digging a shallow trench to bury it in. This has worked fine for us. 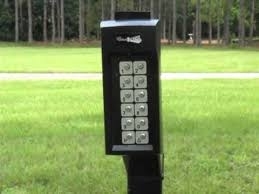 Clickers (remotes) for each car + 2 extra for emergency opening from anywhere on property [T18-ES]. One comes with the kit. *We supplied a 12v Deep Cycle Group 24 Marine Battery, bought locally. Get your equipment from 3 different suppliers: Gatecrafters, Surveillance-Video and Amazon. 1- Estate Swing Single Heavy Duty Solar Package Gate Opener [ES 1000H] Do not order a solar panel with your package; you can do much better, pricewise. 1- Gate Reinforcement Brackets (pair) [GP161229]; Optional, only needed if you are using a tubular farm gate. X- Remotes [T18-ES] Order however many you want; one comes with the ES Package. If you order the main ES 1000H kit from Gatecrafters ($65 cheaper than other supplier, and free shipping), this also gives you access to phone tech support at Gatecrafters (which we found was very good, and it was great to have someone talk you through minor problems; mostly tweaking the settings). 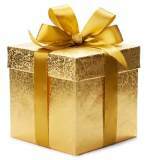 Click on each item below to order (we get no commission). Installation was a little tricky. We needed the optional gate reinforcement brackets because we were installing a "hollow tube" farm gate. So reinforcement was needed where the opener fastened to the gate. 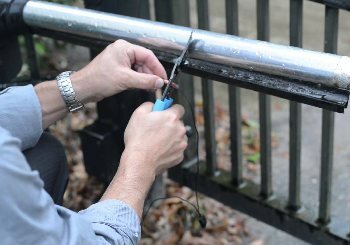 Take your time with cutting and positioning the gate bracket "boomerang". 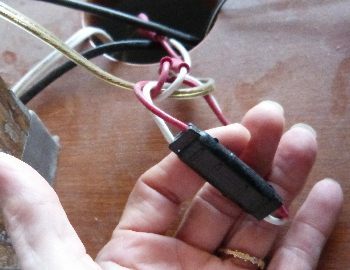 Carefully follow directions for wiring this device up. Take pictures and/or make diagrams of where all the wires go for future use. Setup and operating parameters take a little tweaking, but we got them where we want them now. Ie: how long the gate should stand open before re-closing. We felt the optional gate lock was essential. 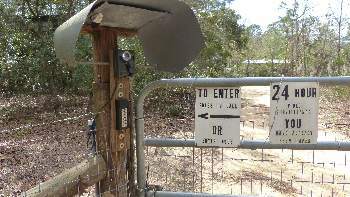 It securely holds the gate closed in a mechanical grip (intruder can not push the gate open). 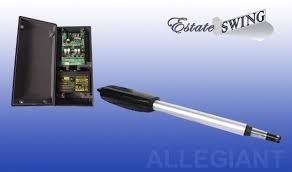 Exit sensor wand (buried in driveway) detects any large metal object passing by (car, 4-wheeler) and opens gate automatically to allow them to exit. Party mode button holds the gate open until released, for events where lots of cars will be coming and going. TIP: If you live in a subdivision or gated community, check with homeowner rules first. Also, contact your county building department to see if a permit is needed to install one of these. TIP: If it's just beyond your skills, Gatecrafters can help you find a local installer. 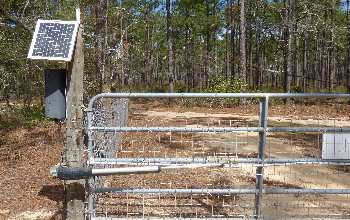 When we first decided to install an automatic gate opener, several friends and neighbors advised us not to do it, because automatic gates are prone to lightning damage. In fact, they even went so far as to call the gate a "lightning magnet". Well, it turns out they were right, it really is a lightning magnet. 1. Install a lightning rod per these instructions. 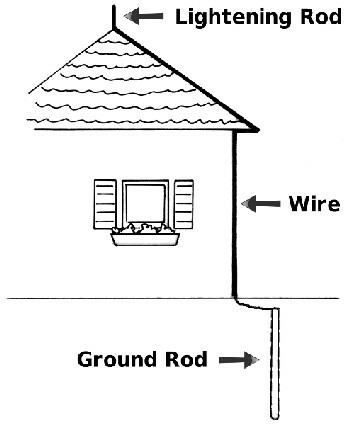 A lighting rod is meant to attract lightning and divert it around the structure into the ground. This is the top of the long copper ground rod pounded into the ground. 2. Install a surge suppressor inside the battery box at the gate. This is the model number: DTK-4LVLP-CR. You can find one here. 3. Install a line disconnect to the inside monitor. 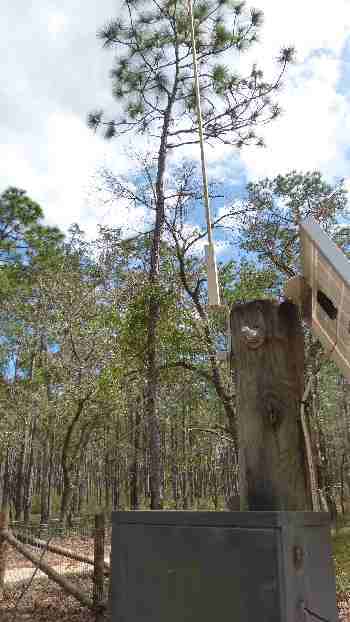 Once we installed the lightning rod and surge suppressor as in #1 and #2, lightning strikes never hurt the equipment out at the gate. But a good strike still snaked it's way up the connecting wire and fried the inside monitor and/or the monitor's power cord. Quick disconnect solved the problem. Scott installed a quick-disconnect in the line, right before the monitor. 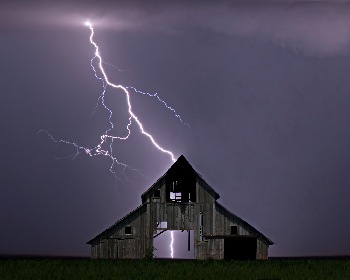 We just unplug the line from the monitor during lightning storms. A bit of a pain, perhaps, but it has prevented any more fried monitors ever since we did it.